The opening foray, the 1834 "Andante spianato and Grande Polonaise brillante", glistens in the opening pages, a dragonfly approach rife with color . . . The silken rubato in the keyboard part has a velvet glove from conductor Urbanski . . . [Chopin / "Krakowiak"]: The counter-themes for this evanescent and charming rondo become tender and melancholic . . . Lisiecki adds his own occasional ornaments to the glistening line, to which flute and other winds lend their distinctive voices . . . [for this] splendid and elegant piece, we can admire Lisiecki . . . [Chopin / Fantasy on Polish Airs]: Lisiecki achieves these dance transitions with streamlined grace, effortless poise that maintain the work's nobility and folk roots, at once . . . [the Nocturne bears a melancholy stamp with which Lisiecki honors Chopin] in his rendition, ending this fine disc with a loving performance of rarified poem in sound. The young Canadian makes the most of his star turns with playing that is technically dazzling; furthermore, while projecting the virtuosity that Chopin built into the music to show off his own talents and wow the crowds, he is also sensitive to what he calls Chopin's "bel canto style." While Lisiecki can toss off a proliferation of notes at top speed, he also takes the time to shape phrases and to maintain a singing line when required . . . the best piece on the CD is the "Rondo à la Krakowiak" . . . Chopin's variations on the Don Giovanni-Zerlina duet, "Là ci darem la mano", is also memorable . . .
Lisiecki's playing is unerringly precise with a lightness of touch that gives him astonishing tonal control, speed and clarity. He approaches Chopin with calm introspective depth unusual for an artist so young. The "Nocturne in C-sharp Minor Op.Posth." demonstrates this with its mellow left-hand accompaniment of a brighter line in the right. Lisiecki's finish is astonishing in its balanced perfection . . . Every track on this CD is extraordinary . . . the showpiece is the set of Variations on "Là ci darem la mano" . . . Speed, technique, astonishing rapid octaves and other devilish Chopinesque devices make this performance an example of genius running joyously amok. Lisiecki plays beautifully with orchestra. A natural ease keeps him in step with the ensemble through the "Rondo à la Krakowiak in F Major Op.14" and the "Andante Spianato & Grand Polonaise Brillante Op.22".
. . . a very fine recording indeed . . . a triumph . . . Lisiecki's "jeu perlé" execution is a real delight. Moreover, his varied touch and tone have been superbly captured . . . I was equally impressed by some characterful wind solos . . . Time and again his buoyant rhythms, spontaneity and crisp articulation (try Vars 2 and 4 of the Mozart Variations -- altogether the best version I've come across) married to a touching lyrical introspection (listen to his handling of the Introduzione of the "Krakowiak" Rondo) leaves some distinguished competition trailing . . .
With a huge sound, enviable palette and undeniable technique, Lisiecki makes a strong case for many of these pieces. Strongest of all is the "Andante spianato e Grande Polonaise brillante", a piece not short of fine recordings . . . [it is also good to have] the "Krakowiak" and the "La ci darem la mano Variations" coupled in such polished performances . . . with fine, idiomatic support from orchestra and conductor in a natural, warm soundscape, this will appeal to listeners keen to explore . . .
. . . [everything on "Chopin Works"] depends on the soloist and Lisiecki rises to the challenge. His playing is full of imagination, poetic in the dreamy passages and with wit and caprice in the fast and brilliant ones. He is always elegant, with immaculate passagework which flows like oil and is brilliant without that steely hardness which can affect superb technicians. He is always willing to play quietly. His tone is never forced and his pedalling is light . . . [Lisiecki makes these early works] very attractive . . . Strongly recommended. With a huge sound, enviable palette and undeniable technique, Lisiecki makes a strong case for many of these pieces. Strongest of all is the "Andante spianato e Grande Polonaise brillante" . . . [the "Krakowiak" and the "La ci darem la mano Variations" are given] polished performances . . . with fine, idiomatic support from orchestra and conductor in a natural, warm soundscape . . .
. . . [Variations On "La ci darem la mano"]: one of the best [recordings] . . . Mr. Lisiecki's exquisite account of the variations may bring overdue attention to a piece that was pivotal in Chopin's emergence as a compositional star. Though he was not naturally drawn to writing for orchestra, the work's scoring, if somewhat awkward, has nice color and variety. The piano writing, nodding to the taste at the time for florid, virtuosic passagework, brims with brilliance and rippling runs, as well as captivating elegance and intricacy . . . Mr. Lisiecki's blend of youthful brilliance, refinement and grace are perfect for this music. All the performances on this album are outstanding, especially the "Grande Polonaise Brillante" . . .
. . . [Lisiecki's playing] is captivating throughout. Critics routinely apply the word "poetic" to him . . . what Lisiecki can do in gossamer passagework defies belief . . . At the same time, he's capable of considerable power, and his musical instincts are those of a potentially great keyboard artist . . . Lisiecki is out to dazzle us with sparkling performances, and he succeeds handsomely. The pianist's flourishes in Chopin's youthful "style brillante" are delightful . . . The recorded sound is splendid . . . In the two solo pieces one hears the remarkable maturity of his interpretation . . . [the quietly hypnotic effect of the Nocturne] makes me feel confident that Lisiecki has left his prodigy status behind and will enjoy a distinguished career. 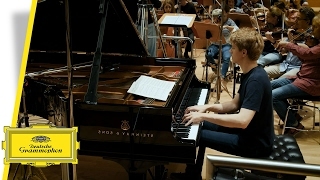 Stylish and robust Chopin from Jan Lisiecki, crisply partnered by the Hamburg orchestra. From sparkling runs in the "Fantasy on Polish Airs" to quiet introspection in the Nocturne in C-sharp minor, this is finely judged playing.
. . . [poetry is much in evidence in the "Chopin Works"] from the young Canadian phenom Jan Lisiecki . . . [Lisiecki's feathery touch and refined phrasing is] almost uncanny in someone who had just turned 21 when this album was recorded . . .
. . . [Jan Lisiecki, Gramophone's 2013 Young Artist of the Year, makes] the greatest impression in accounts of Chopin's four less-frequently heard works for piano and orchestra. Lisiecki leaves competitors trailing in his wake. Gleich im ersten Stück, dem "Andante spianato", zeigt er, mit welchen Massstäben er gemessen werden will: . . . Ungemein feingliedrig, hellhörig und ausgesprochen kantabel: Belcanto auf weissen und schwarzen Tasten. Gleichzeitig zeigt Lisiecki ein untrügliches, sozusagen fast wahlverwandtes Gespür für Chopins delikate Rhythmen. Da gewinnt sogar die "Grande Polonaise brillante" aristokratische Noblesse, und in "La ci darem Ia mano" spürt Lisiecki mit beeindruckendem Stilgefühl der musikalischen Verwandtschaft Chopins mit Mozart nach. Ebenfalls auf höchstem Niveau begleitet das NDR Elbphilharmonie Orchester unter der ungemein feinfühligen Leitung von Krzysztof Urbanski . . . was für Feinheiten offenbart er . . . Da kann selbst eine fein ziselierte Hornmelodie zum Ereignis werden. L'Andante Spianato trouve un toucher doux sous les doigts du jeune pianiste . . . Krzysztof Urbanski le dirige avec intelligence . . . La musicalité de Lisiecki, soulignée récemment à la Fondation Vuitton dans une partie de ces oeuvres, permet un très beau "Rondo À La Krakowiak" . . . la légèreté de la Fantaisie Polonaise opus 13 ravit, traitée dans une douceur particulière . . .